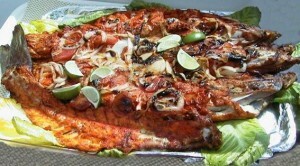 Bbq Fish recipe by Faryal/paris at DesiRecipes.com. Wash and clean fillet of fish with dry cloth. Rub olive oil with brush or with hand on both side of fish and put on aluminum foil. Layer on top with onion & two lemon slices and sprinkle salt , pepper and fennel seed and wrap the foil. Place it on hot B.B.Q grill and cook on high on both sides. When cooked garnish with lemon slice and green fennel leaves.